Sanction Busting! Fight for jobs! Defend the Welfare State! 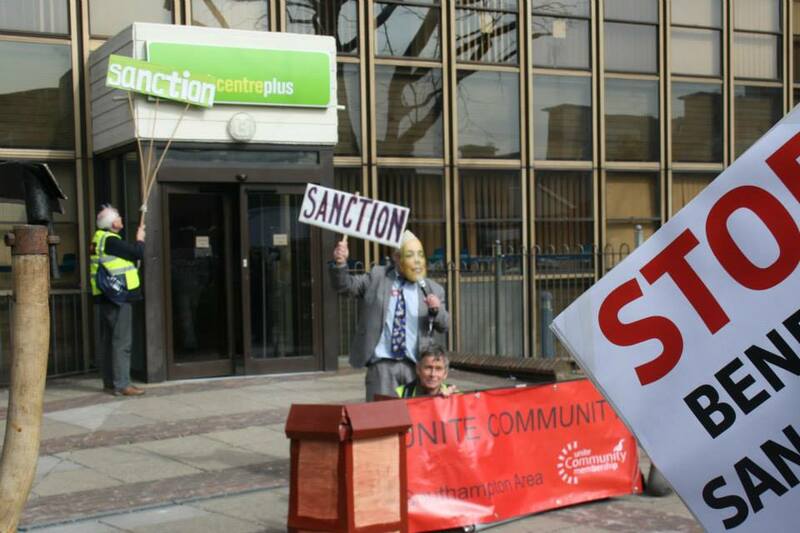 A protest against social benefit Sanctions. Southampton high street served a different purpose than usual today as the setting for the trial of the synonymous Tory MP Iain Duncan Smith and his crimes against the poverty stricken masses of Great Britain. A bustling crowd of union activists slowly gathered in in the Above Bar area today outside the city’s Green and pleasant Palmerston park. After a few photos the crowd mobilised and a grey suited man with a Iain Duncan Smith mask started hassling passers civilians with jibes . .
IDS was marched up the high street by the crowd before being arrested and handcuffed to a mock –Police officer. 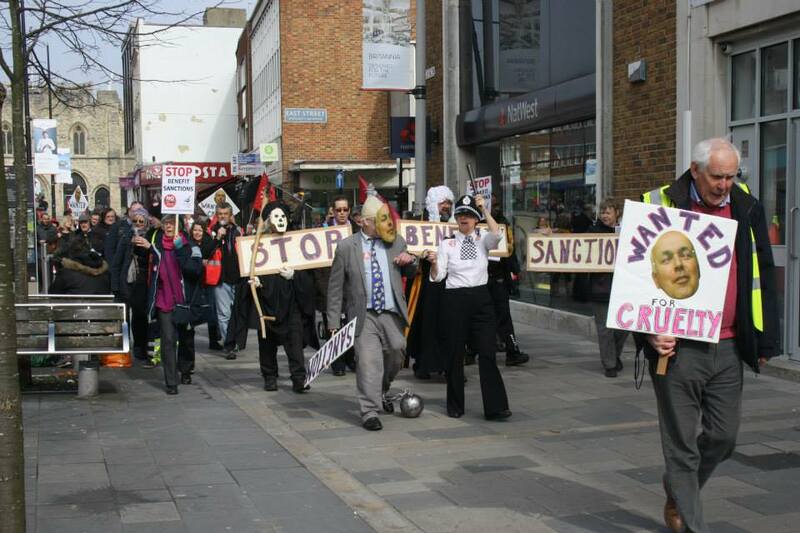 The crowd gathered outside the Southampton Bargate (the setting for Southampton courthouse in medieval times) At the jeers of the crowd IDS was placed in a ball and chains and marched onwards for a street theatre style trial outside Southampton Jobcentre. The atmosphere seemed mainly jovial with all protestors politely following the procession on foot. A few startled public shoppers looked with mixed emotions. As we got to the jobcentre I couldn’t help but notice the chortling from the jobseekers outside when Ian Duncan Smith arrived in ball & chains. Yes, that’s right! People have actually died from this Government’s ongoing debacle, masked under austerity the government continue to find new ways to rob the poorest of society of their social rights and basic living cost. A cap on social benefits which has been accused of targeting the sick and elderly. Huffington Post reported on the 8th Jan 15 that a review has been carried out on the sanctions with discerning consequences ‘particularly the effect on mentally ill and disabled”. Oldham MP Debbie Abrahams went one further back in November last year stating . .
A DWP commissioned review carried out by Matthew Oakley, a welfare expert with experience from both the Treasury and private industry enterprise ‘Policy Exchange’ stated the most vulnerable in society are at risk. 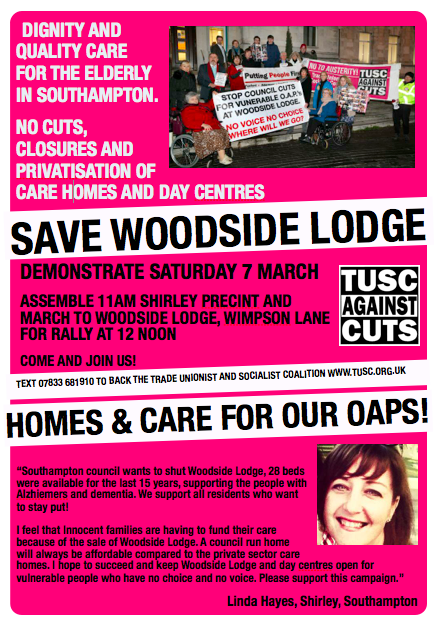 Save Woodside Lodge – Stand Up for Southampton’s OAPs! 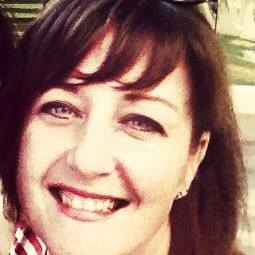 My name is Linda Hayes, from Shirley, Southampton, and I represent vulnerable people within my local area. I am a proud mother of two sons, and work within the local community as a hairdresser, working in particular with people with high needs, such as Alzheimer’s and dementia sufferers. I would like to provide some background about myself that would help you understand my drivers. I have chosen to make a difference In my local community. I aim to help vulnerable people in my community, who don’t have a voice. I am a hard working and driven person, that has always stood up for what I believe is right. I am passionate and I am a people’s person. In the year 2000, my father was diagnosed with Alzheimer’s disease and Louis Body dementia. He was a wonderful father fantastic husband to my belated mother, who sadly died in 2003 of lung cancer. I was very close to my parents and I felt robbed that my parents were taken away from me. My mother even explained how difficult this would be for me knowing my mum is dying of cancer, having to care for my father alone. My mother always had faith in me, knowing I would find the strength to fight. The fight was ongoing; the consultants and the doctors at the Western Hospital wanted to put my father in a nursing home that was unsuitable. I had to fight long and hard to place my father in a suitable EMI nursing home as my father had to be looked after 24/7. With a fighting spirit, I had my father placed in a suitable nursing home of our choice. That reassured my mum while she was alive. Following news that my father was diagnosed with Alzheimer’s disease, I have been actively involved in raising awareness and I have been doing fundraising over the last 10 years. I realized that many others would be in a similar situation to mine and I did my first protest on YouTube in 2006, where I fought for the government and Nice, not to stop the use of a drug called Aricept which was important in prolonging quality life for those who suffered this disease. I spoke out to Gordon Brown saying don’t stop Aricept as this is a tablet provided free of charge to the families, supported by the NHS to assist these vulnerable people. This helped my father at the beginning stages to have a quality of life. My voice was heard as they agreed to keep the tablet available on the NHS. Sadly, my father passed away a day before his birthday 21 August 2007. I realised then how much I cared in the last 10 years for my mother and father. Now it was time for me to be alone in this world as the mother of my children, which was truly hard, especially to lose parents you looked up to as role models. Could I be equally strong for my boys and continue my fight for these causes? I attend Woodside day centre / care home twice a week where I support those vulnerable people with Alzheimer’s and dementia with community and hair dressing services. Woodside was fantastic support locally for me to drop my father in the early years of his diagnosis. He would stay there to give my mother rest, especially in the time she was undergoing Chemotherapy. He enjoyed the visits to the day centre. 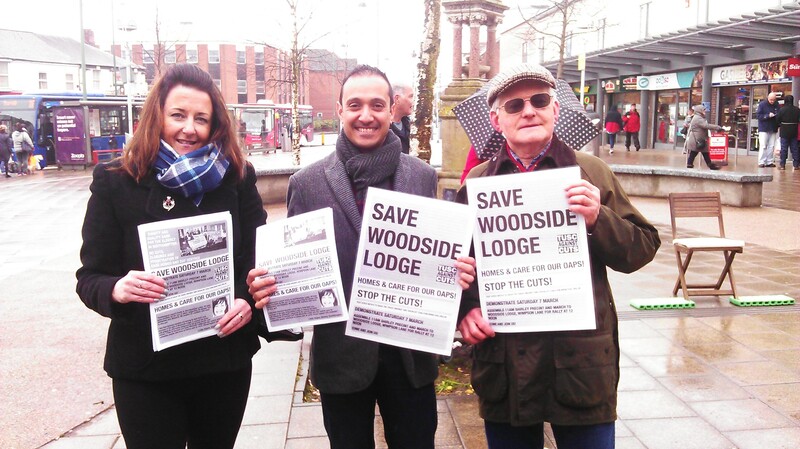 I learned, at the end of 2014, that Woodside Lodge was to be closed down in favour of apartments being built. I do not believe this is the correct decision of the council or government. Why I believe Woodside lodge and day centre should stay open is for the vulnerable people who have no voice. These people have relied on me in the past, knowing that I have experienced a fight in my life losing my parents. The local council wants to shut it down. 28 beds were available for the last 15 years, supporting the people with Alzhiemers and dementia. We were advised that their needs were assessed, and they will be relocated, however I believe there are no places within reasonable geographic coverage, with 24/7 facilities that could support these people. This means increased stress on families, and the local hospitals, in favour of approved planning permission for apartments, which could be built anywhere. Staff who have been at Woodside Lodge will also lose their jobs. I have attended the meetings at the Southampton City Council representing the public and it was a waste of time as sadly they have already committed to the closure of Woodside. Following the last meeting I decided to do a protest outside Southampton Civic Centre. Coxford Councillors Don Thomas and Keith Morrell helped my campaign, including the Socialist Party. The protest went well and my voice was heard. I feel that innocent families are having to fund their care from the sale of the home, for the costs of the council run home. As well as social funding, council homes will always be affordable compared to the private sector care homes. I have been on BBC Radio Solent, with Julian Clegg and have also contacted Russell Brand to help my campaign and my local newspaper. The Echo, Alzhiemers Society, and Mind Mental Health Fiona Phillips from GM TV has also tweeted me I have made the local councillors of Southampton and Labour MPs John Denham and Alan Whitehead aware of the support for my campaign. I hope to continue my fight to succeed and keep Woodside Lodge and day centres open for vulnerable people who have no choice and no voice. Margaret Thatcher ended her days in the Ritz at a cost of nearly £3,500 per nigh to the taxpayer. She was well looked-after with dementia with private care around the clock. These people are not as fortunate, and I do not believe they deserve to be treated this way, without any support. I hope to be their support. 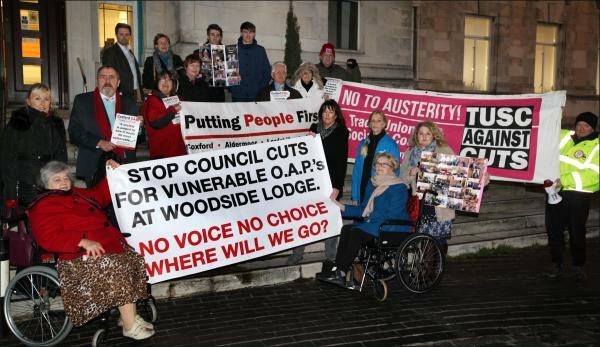 If Southampton Labour Council still want to close Woodside Lodge this year, my next protest will be to David Cameron at 10 Downing Street London. 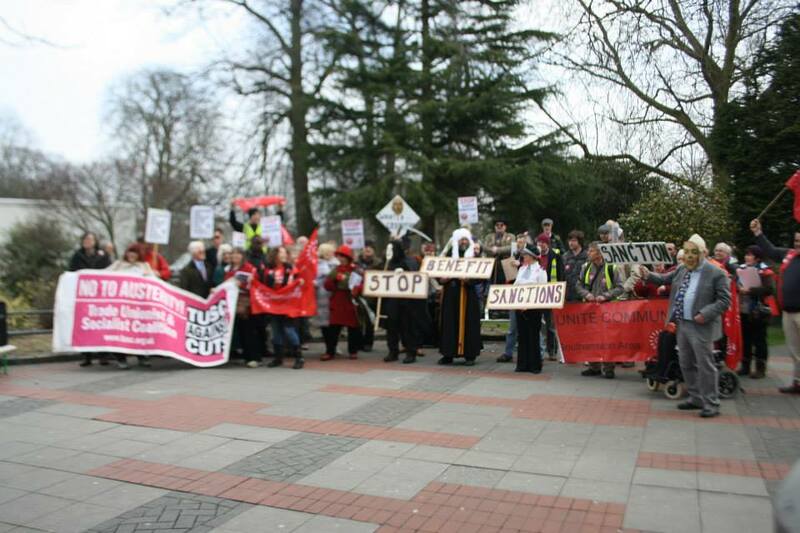 Southampton Trade Unionist & Socialist Coalition is opposed to all cuts to jobs, services, pay benefits and pensions. We oppose the privatisation of public services. We are campaigning for the restoration of government funding stolen from Southampton council since 2010 by the ConDem coalition government. We are standing candidates in the local and general elections this May to fight for lost jobs and services to be restored to the city. If you agree join the campaign.